everyday journeys a real pleasure. concept of portable mobility scooter design. performance and an extended range. *UK market speed limited to 4mph / 2.4mph. 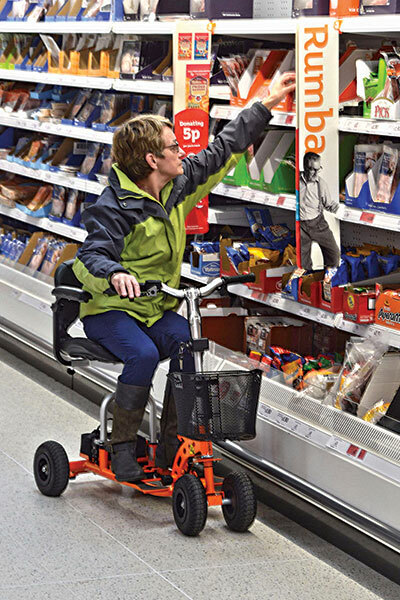 Designed for comfort and manoeuvrability, these lightweight scooters can help make your everyday journeys a real pleasure. Suitable for travel by car, train, aeroplane and on-board cruise ships. 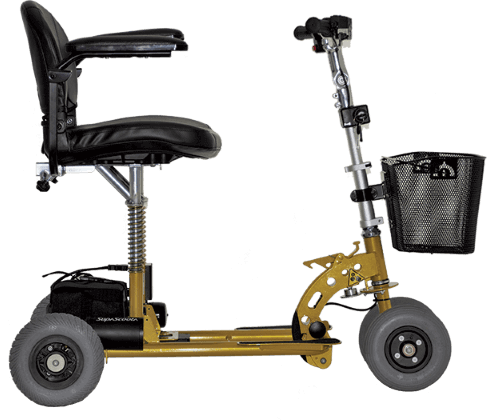 The SupaScoota is often talked about as the world's lightest mobility scooter, now equipped with electronic stability control for your peace of mind. It has been engineered with performance and functionality in mind, making the SupaScoota the best choice for most people. The SupaScoota puts the joy back into the journey so you can focus on your destination. These are the only scooters that can switch between SLA and Lithium batteries in a matter of seconds. Another function that makes the SupaScoota stand out from the crowd is the optional spare battery tray. When one battery runs out, you can simply plug into the spare, and double your travel distance. 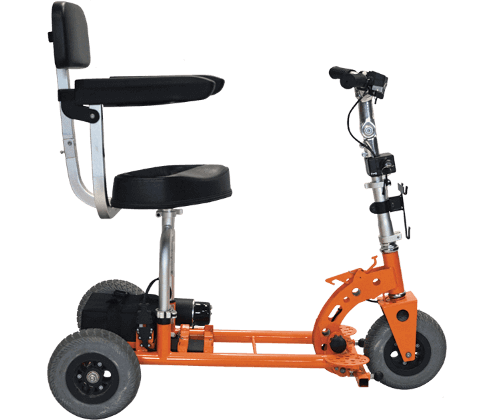 One of the lightest 3 wheel scooters, perfect for the experienced user. 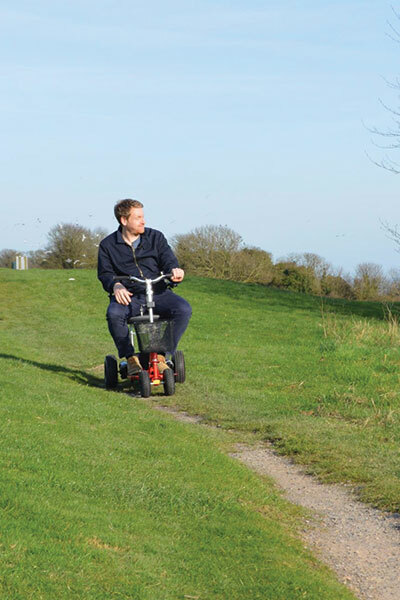 Speedy & agile with an acute turning circle. An ideal shoppping companion, perfect for browsing those busy aisles. The twin motor provides a greater distance, making this scooter fantastic for day trips with family and friends. For the adventurer who loves spending time outside. 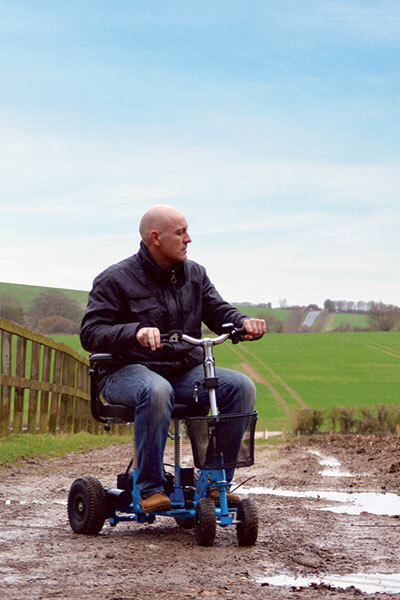 This scooter can cope with most conditions and terrains. 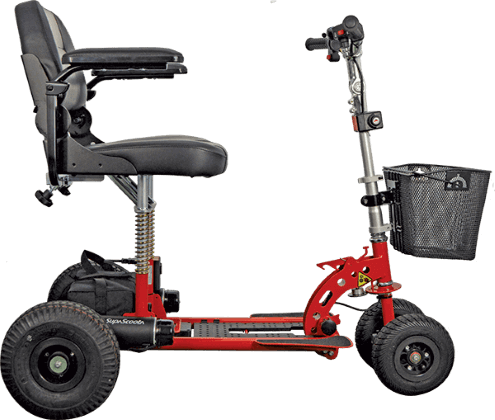 The twin motor and longer wheelbase makes this scooter a great choice for the adventurer who requires that extra power and added comfort. 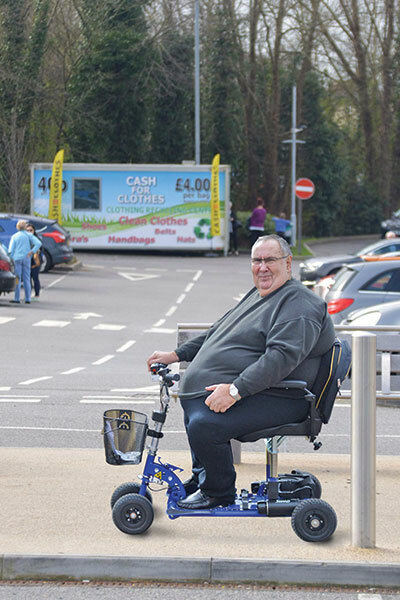 Ideal for the larger person who wants to retain their independence with an easily portable travel scooter. Stylish, compact and robust... the only portable mobility scooter that has a range of models designed to accommodate your every need. You won't find anything better than the SupaScoota for ease of use. 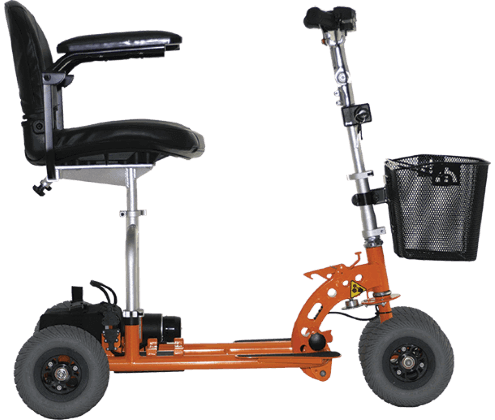 The SupaScoota challenges the traditional concept of portable mobility scooter design. Versatile, practical and convenient. There is no other scooter quite like it! One of the many outstanding features of the SupaScoota Range is the way it can be dismantled for storage or transportation. 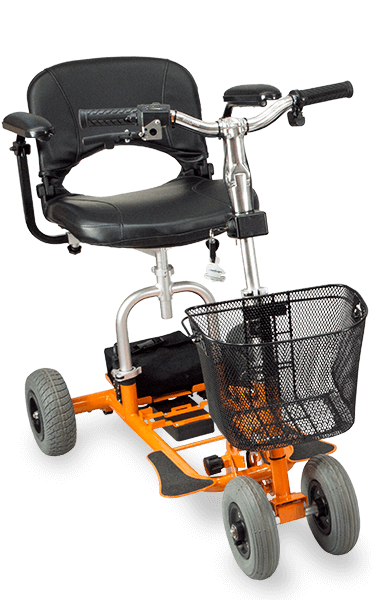 The clever design allows the user to dismntle - when required - the scooter. The photos below show several ways the SupaScoota can be made lighter. Remember, we're not asking you to remove all parts every time. It's only necessary to remove the appropriate sections, until the scooter is at a comfortable lifting weight. In this photo (above), the seat has been removed. Once folded down, this should be manageable for most people to lift into a car or storage space. 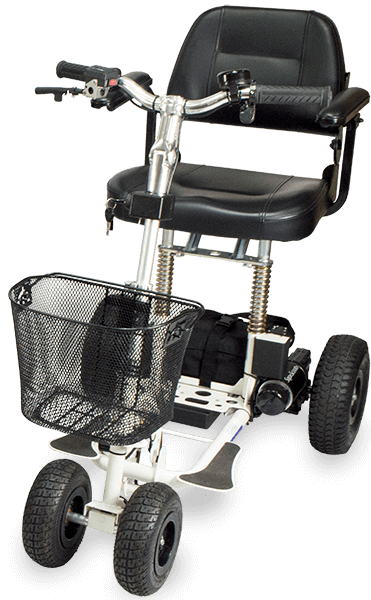 If you do struggle to lift the SupaScoota with only the seat off, then to make life easier it can be made even lighter by removing the battery and splitting the wheelbase in half. What if I'm still struggling to lift the scooter? Well, the wheels are removable too, making the scooter lighter still. 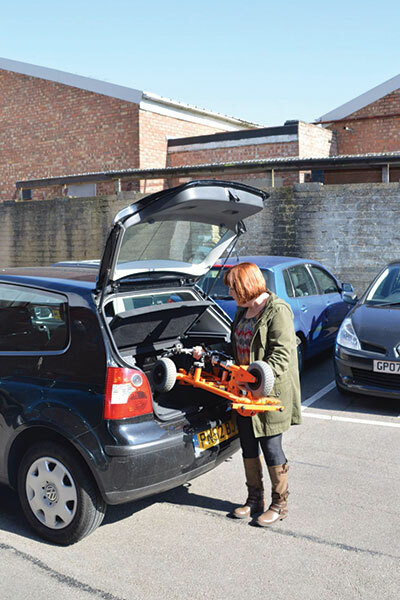 When the scooter is folded, it can be stored horizontal or upright in a small space or in a car boot. 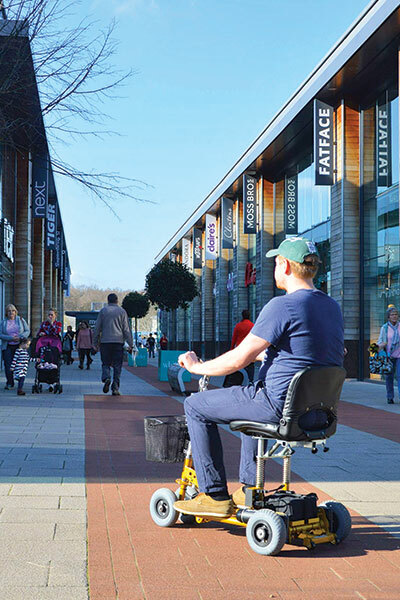 Your opportunity to try our unique range of lightweight mobility scooters in the comfort of your own home. Benefit from our vast experience and established national company. Free Home visits with definitely NO obligation. Unique range of portable mobility scooters. Super solutions to suit all. Reliable and thorough after sales care. 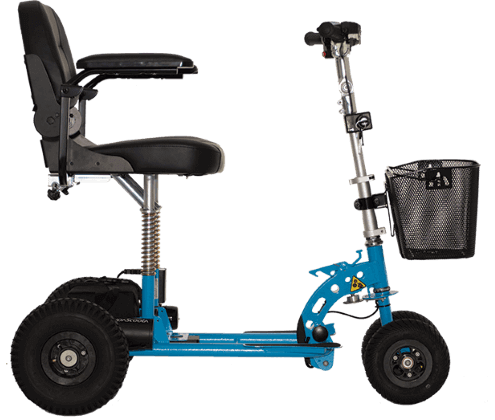 Please fill in this form to have your questions answered, or to enquire about renting or purchasing a SupaScoota or one of our other lightweight mobility scooters. You may also be eligible to enjoy a FREE home demonstration of five of the best folding mobility scooters, all without obligation. Disclaimer: We have done eerything possible to provide accurate information regarding the SupaScoota Range within this website. Before making your decision on which one to purchase, we would fully recommend an assessment either through us or with your local dealer, to ensure that you have a model which meets your needs. 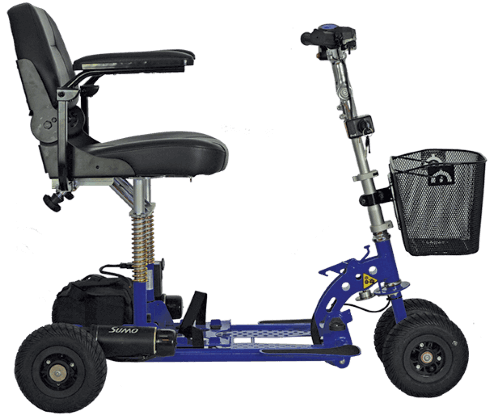 Please note that the performance of any mobility scooter is dependent on several factors, including weight, medical condition, terrain and regular maintenance. At the time of writing, all measurements amd the weight of individual parts are accurate.